When I was seven, a good flax crop allowed my parents to purchase a piano. It was supposed to be a surprise for me, being delivered while I was at school. 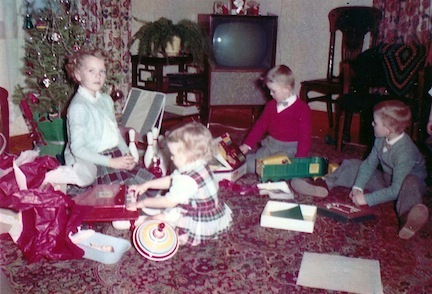 Either no one had told my cousin Greg that it was to be a surprise, or he just couldn’t hold it in any longer, because he burst out, “You’re getting a piano today!” I began lessons the following year, and Greg made up for everything — I was a farm kid, unused to navigating my way around town by myself, and when it came time to walk to my piano teacher’s house at lunchtime, I didn’t remember where to go or how to get there. Greg walked me to the corner, and pointed me to the street one block over where my teacher lived. I’ve always said that if it weren’t for Greg, I might never have learned to play the piano! This photo was taken when I was nine or so. My piano lessons evolved into half an hour lesson on the piano, and half an hour on the church organ, and I later became organist at a small church in another town, and eventually took over in our own church as well. I played the piano for the high school graduation Grand March a couple of years, then we moved to the city, and although I stopped taking lessons, I kept playing, becoming a kind of freelance substitute organist in various United Churches around the city. I moved to another city for three years, and rented an old upright piano for that time, moving it with me to the three different apartments I lived in while there. 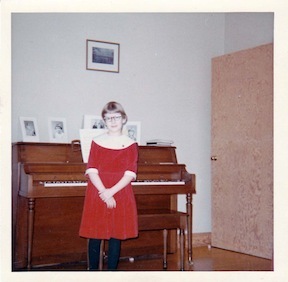 Then I moved to Winnipeg and got a job at a music store — and began taking piano lessons again, with one of the teachers at the store. But, I had no piano! I started going in to work an hour before I opened the store, to practice on one of the studio pianos. I arranged to practice at a friend’s home one evening a week. I was taking voice lessons as well, from Dorothy Lawson, the wonderful singing teacher who had taught my mother and my uncle in days gone by. 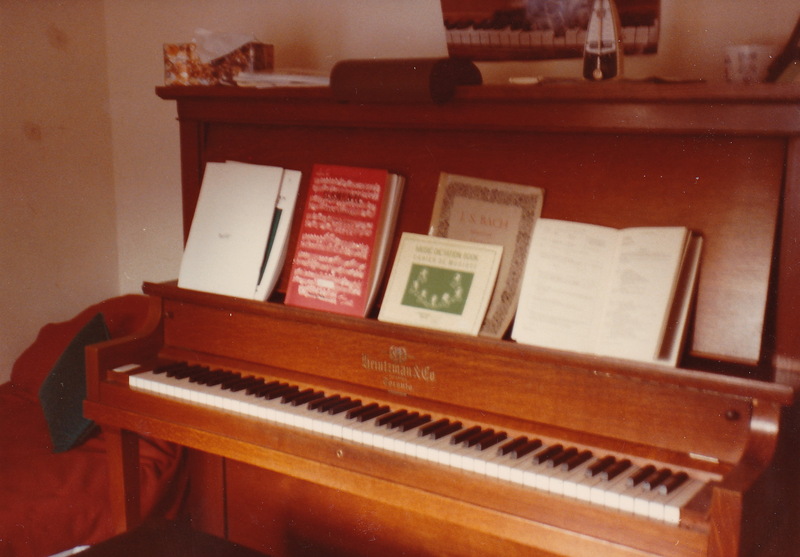 She invited me to practice at her place, on the “little piano” — an upright Heintzmann in the back bedroom. I would go there on Saturday mornings, and other days as well. Later, I shared the house with Dorothy, living on the upper floor. It was a wonderful experience to hear voice lessons going on at all hours of day or evening — some of her students were very accomplished. 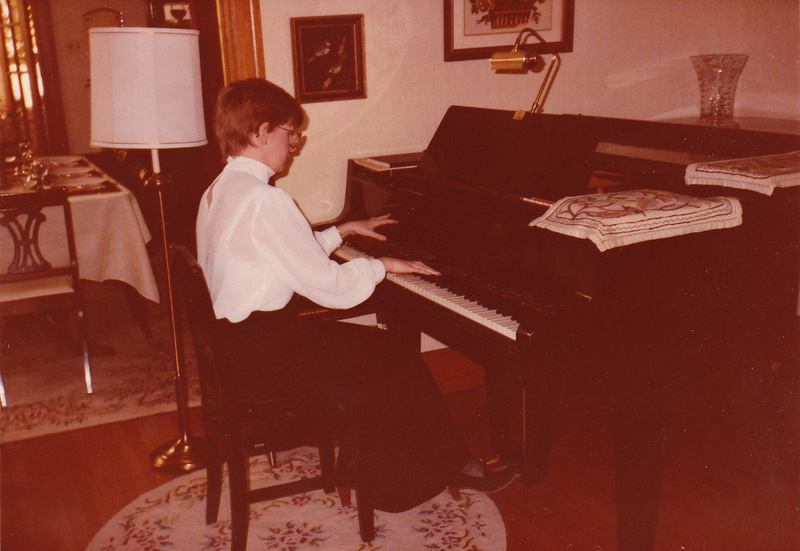 Two of my favorite memories of playing that piano were 1) while I was practicing a Kuhlau Sonatina, she came into the room and said, “You’re missing a G sharp in that run, and you might as well correct it before it becomes a habit,” (what an ear for music!) and 2) once we were looking after her daughter’s cat, Rudolf, who loved to sit on the top of the piano. Once I started playing, and Rudolf jumped down, pawed the door open, and left abruptly. Ellie was a much more accomplished pianist than I, and Rudolf had a discerning ear! It was always a delight, and an honor, when Dorothy would come into the back room and say, “Why don’t you come out and play that on the big piano?” The “big piano” was a Petrof grand with a glorious tone, that I loved to play whenever I had the chance. In April 1984, I moved into an apartment — and immediately missed the ready access to the piano that I’d had at Dorothy’s. In May, taking advantage of a Mother’s Day special, and going a bit beyond my means, I made a down payment on a piano. It was delivered on May 12, 1984. 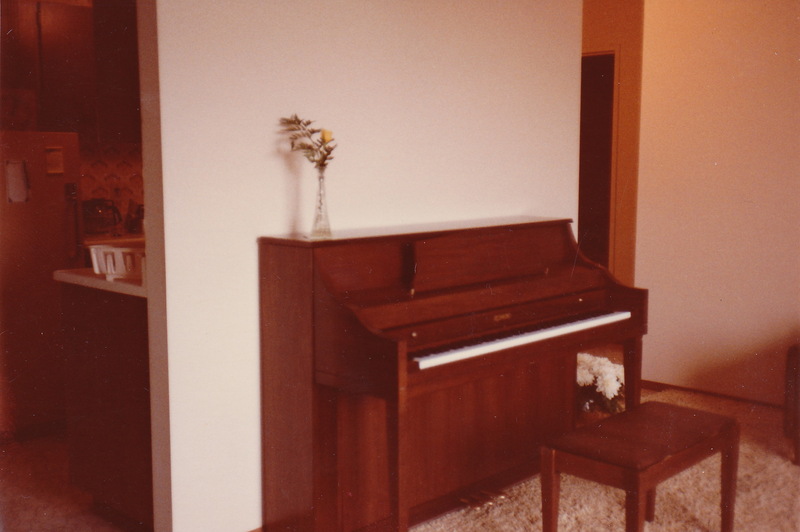 Note the chrysanthemum plant on the floor to the right of the piano — that was delivered with it, as part of the Mother’s Day special. This piano has enhanced my life in many ways ever since. So, happy 29th anniversary, Redmond! Thank you for all the music. What a fabulous anniversary to celebrate and thank you for taking us down your piano memory lane! I loved your anecdotes about the G# and Rudolph! Thanks, Joanna! I enjoyed the trip down memory lane, too! Oh,Beth, what a lovely memory. My Nana had an upright in her house. I knew I could make songs from it (I was 4). Loved it so much but one day it just disappeared. I never got to take lessons and have never owned a piano, but I still love them. Happy piano anniversary to you, Beth! 🙂 I loved reading this because while I’m not entrenched musically, it did remind me of my own teeny-tiny toy “grand” piano when I was really little and how I so much wanted to take lessons when I sat in on my mom’s lessons when I was 4. You know what’s interesting? My boys took piano for about 6 years before switching to guitar (which they both seem to enjoy a lot more) and so I was going to get rid of the piano just to make room. No bites. I was told by 2 other friends who were also trying to sell their pianos that they had no takers either. One of them even tried to give hers away and still no one wanted it. What’s up with that?? Thanks, Teresa! Weren’t those teeny-tiny “grand” pianos a delight? As you can see, I loved mine as a wee one! I suspect a lot of people are interested in electronic keyboards instead of “real” pianos these days, which seems a shame to me. What a wonderful walk down memory lane — and I could relate. Our pianos look similar. I grew up on a Baldwin (now 80+ years), but bought my own Baldwin piano in 1978. I know that feeling and I continued to play for years until recently. I still own it — my joy. I studied with various teachers for over 20 years. Never played the organ — lucky you! Thanks for sharing your memories and they brought back mine. Thanks, Pat — and thanks for sharing your memories as well. There’s something about playing a piano. Playing could let me express my emotions when nothing else could. I suspect you’ve experienced that as well. Wonderful to hear all about your piano playing, Beth. My sister was very similar with her organ and then piano. It is such a gift and really hard work doing all the practises, well done. Thanks, Catherine! I admit when I was a kid, Mum & Dad had to struggle to get me to practice — and then suddenly everything “gelled” and I found joy in playing. This was a great story! Thank you for sharing this. 🙂 I think it is nice when kids have music and can learn to play music! Thanks, Erik! I enjoyed sharing my piano stories! Oh, I love this whole comment, Susanna! What a joy to have your piano in your office — musical interludes are soooooo great. And what fun that you have a music-loving dog! Thank you for sharing these stories. They warmed my heart and made me smile. Yay! Your post makes my heart sing. What a special relationship you’ve had with your teachers and their pianos. Oh what a lovely thing to say, Mary! Thank you! Yes, some of my teachers were very special to me.